After making the move from Slovakia as a teenager, Hossa was selected 12th overall by the Ottawa Senators in the 1997 NHL Draft. The top-5 of the draft that year was loaded with Joe Thornton (1), Patrick Marleau (2), Olli Jokinen (3) and Roberto Luongo (4), but the Senators were thrilled to get Hossa at #12. 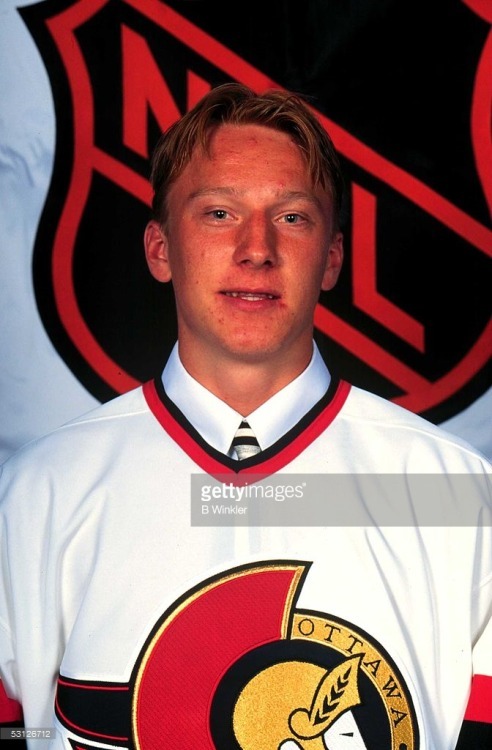 Shortly after being taken in the NHL draft, Hossa was selected 5th overall in the 1997 CHL Import Draft by the Portland Winterhawks in the WHL. Hossa played 7 games with the Senators to start the 1997/1998 NHL season, but had just 1 assist and was ultimately shipped back to Portland for the rest of the season. Despite the disappointment of not making the NHL, the 1 year Hossa spent in junior hockey was a huge success and ended up being a sign of things to come in his NHL career. In his rookie (and only) year in the WHL, Hossa scored an impressive 45 goals and had 85 points in 53 games while leading the Winter Hawks to 1st in the league at 53-14-5. He followed that up with 13 goals and 19 points in 16 playoff games with the Winter Hawks winning the President’s Cup (now known as the Ed Chynoweth Cup) as WHL Champions. The Winter Hawks went on to the 1998 Memorial Cup, along with host Spokane Chiefs, OHL Champion Guelph Storm and QMJHL Champion Val-D’Or Foreurs. The Winter Hawks would sweep the round robin, outscoring opponents 17-8 in 3 games and earning a berth to the finals where they would defeat the Guelph Storm 4-3 in OT to win the Memorial Cup. Hossa finished 2nd in the tournament with 9 points, scoring 5 goals and adding 4 assists in 4 games. Hossa ended his junior career winning the WHL Rookie of the Year, while also being named to the CHL First All-Star Team and Memorial Cup Tournament All-Star Team. Hossa became one of the NHL’s best scorers in the first few years of the millennium, scoring 32, 31, 45 and 36 goals in what would end up being his last four years with Ottawa. In 7 years with the Senators, Hossa would score 188 goals and put up 390 points in 467 games, while adding another 13 goals and 34 points in 51 playoff games. With a lockout cancelling the 2004/05 NHL Season, he became a free agent and was signed to a 3 year, $18 million deal with the Senators. However, he was then traded that same day to the Atlanta Thrashers in a blockbuster deal (along with defenseman Greg DeVries) for forward Dany Heatley, a controversial trade considering it was following the Heatley car accident which claimed teammate Dan Snyder’s life. 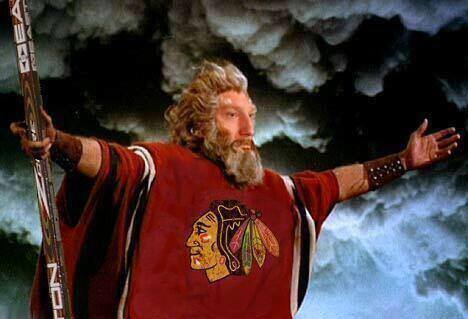 Either way, Hossa was set to join the Thrashers and start a new era in his career. Despite a career-high 82 points in his last year in Ottawa, Hossa was looking to take his career to new heights in the post-lockout NHL with his change of scenery in Atlanta. Playing on a supremely talented line with Ilya Kovalchuk and Marc Savard, Hossa would score 39 goals and a career-high 92 points in 2005/06 (Kovalchuk 98 points, Savard 97 points). He followed that up with his best statistical NHL season in 2006/07, with 43 goals and a career-high 100 points while playing all 82 games for the first time in his career. The Thrashers would go on to win the Southeast Division Title and secured a playoff spot for the first time in their franchise’s career, however they ended being swept by the New York Rangers with Hossa picking up just 1 assist in 4 games. Heading into a contract year in 2007/08, the Thrashers and Hossa couldn’t reach a deal and he became the subject of trade talk despite scoring 26 goals and 56 points in 60 games that season. At the Trade Deadline in 2008 he was dealt (along with Pascal Dupuis) to the Pittsburgh Penguins for Colby Armstrong, Erik Christensen, prospect Angelo Esposito and a 1st-round pick. In 3 years with the Thrashers, Hossa would score 108 goals and put up 248 points in 222 games. Hossa went from one of the worst teams in the NHL to an emerging young powerhouse in the Pittsburgh Penguins, which featured the likes of young Superstars Sidney Crosby and Evgeni Malkin. He scored 3 goals and had 10 points in 12 games to end the regular season, finishing with 29 goals and 66 points in 72 games with the Thrashers/Penguins. However, it was during the playoffs where Hossa really came alive for the Pens, scoring 12 goals and 26 points in 20 playoff games where the Penguins fell 2 wins shy of winning the Stanley Cup. Despite a tough loss to the Red Wings (which lead to the famous Hossa on the boards picture above), he finally proved that he can produce in the playoffs after previous failure with Ottawa and Atlanta. 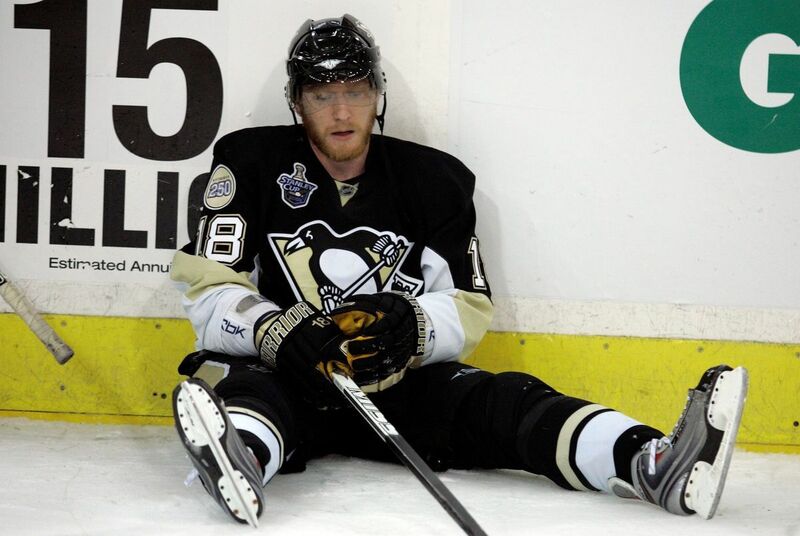 The Penguins did all that they could to try and sign Hossa, offering him a 5-year $35 million deal, however Hossa would end up leaving for the team that just beat them in the finals in the Detroit Red Wings. Hossa signed a 1-year, $7.45 million deal with the Red Wings, turning down more money and longer terms from other teams in hopes of joining a contender and winning a Stanley Cup. With Kirk Maltby wearing #18 in Detroit, Hossa would make the switch to #81 which he would keep for the rest of his NHL career. He seemed to make the transition to the Red Wings very smoothly, scoring 40 goals and 71 points in 74 games during the 2008/09 season. 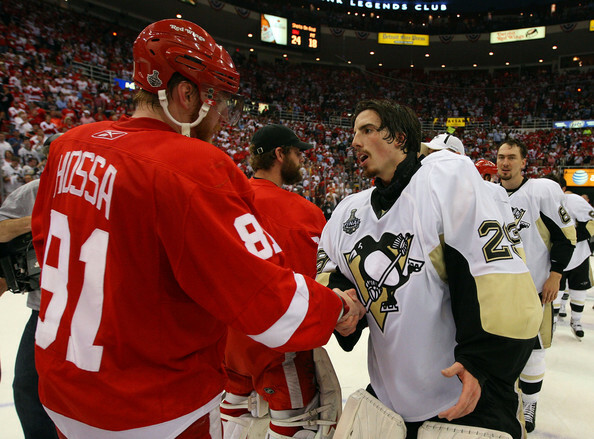 The Red Wings marched all the way back to the Stanley Cup Finals, meeting (his former team) the Pittsburgh Penguins for the 2nd consecutive season. Unluckily for Hossa, for the 2nd year in a row he was on the wrong end of the Stanley Cup Finals as the young Penguins defeated the Red Wings in 7 games. Despite the heartbreak for a 2nd straight year, Hossa would still score 6 goals and 15 points in 23 playoff games and remain a top free-agent target heading into the summer of 2009. After two straight Stanley Cup losses with two different teams, Hossa signed a whopping 12-year $62.8 million deal with the Chicago Blackhawks. Much like when he was traded to the Penguins, Hossa was joining a Blackhawks team featuring two rising superstars of their own in Jonathan Toews and Patrick Kane, and Hossa seemed like the missing piece of the puzzle for the young Hawks. Despite missing the first 2 months of the season following shoulder surgery, Hossa would provide an instant spark for the Hawks scoring 24 goals and 51 points in 57 games during the regular season. The Hawks would bulldoze their way through the playoffs to the Stanley Cup Finals, with Hossa reaching the Finals for the 3rd consecutive year with a different team each time, the only player in NHL history to do so. With 3 goals and 15 points in 22 playoff games, Hossa played a big part in leading the Blackhawks to winning the Stanley Cup in 2010. 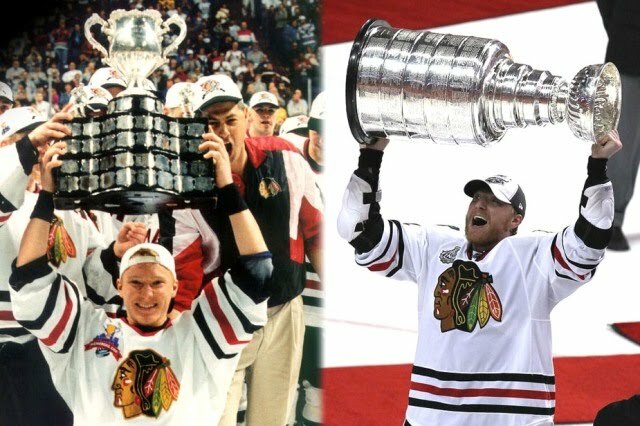 Hossa finally won Lord Stanley after two straight years of heartbreak and following just short, and he seemed to have finally found a permanent home in Chicago after years of moving from team to team. Hossa has spent 8 seasons (including this year) with the Blackhawks since signing his long-term deal, including winning the Stanley Cup in 2010, 2013 and 2015. After being criticized for not being a playoff producer early in his career, Hossa has 73 points in 103 playoff games with the Hawks. In 8 years with the Blackhawks, he has 169 goals and 385 points in 477 games including 9 goals and 15 points in 16 games this season. He turns 38 in January, but is also signed through 2020/21, so Hawks still have plenty of hockey left from #81. Hossa has been a mainstay on the Slovakian national team since emerging onto the hockey scene, representing Slovakia 14 times at the junior/professional international level. Hossa played for Slovakia at the 1997 and 1998 World Juniors, where he scored 9 goals and 15 points in 12 games (Slovakia finished 6th and 9th). He has represented Slovakia on the men’s national team 12 times, playing in the World Hockey Championship (1997, 1999, 2001, 2004, 2005, 2006, 2007, 2011), World Cup of Hockey (2004) and Olympics (2002, 2006, 2010). In those 12 tournaments, he has 29 goals and 67 points in 71 games with the best finish for Slovakia being 4th at the 2010 Olympics in Vancouver. He had the chance to represent Team Europe at the 2016 World Cup of Hockey this past September, with 1 goal in 6 games as Team Europe won the Silver Medal losing to Canada in the finals. Hossa has been an all-star 5 times in his career, twice with the Ottawa Senators (2001, 2003), twice with the Atlanta Thrashers (2007, 2008) and once with the Chicago Blackhawks (2012). As mentioned above, Hossa has had great success winning at both the junior and NHL level. He won the WHL Rookie of the Year, WHL Championship and Memorial Cup in his lone year with the Portland Winterhawks in the WHL. Most notably though, he has been an integral part of the Chicago Blackhawks Stanley Cup wins in 2010, 2013 and 2015. Despite turning 38 in January, Hossa is signed through 2020/21 in Chicago and Hawks fans are thrilled to have #81 in their organization.